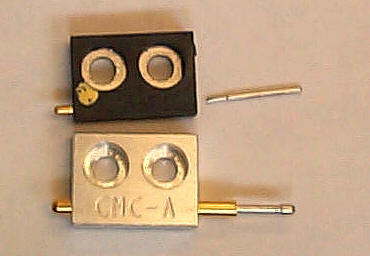 These parts are used in the CP-6 and CP-7 machines in the board carriers (both the "in" and "out" carriers). Our assembly consists of two separate components: the aluminum body with the receiver, and the spring pin. A broken spring pin can be easily pulled out of the receiver with needle-nosed pliers. Then, a new spring pin (ADCQK 80X0 - SP), can easily be pushed into the receiver, without removal of the body from the board carrier. This saves considerable maintenance time. Our complete assemblies are significantly less expensive than the OEM parts, and the spring pins by themselves (ADCQK 80X0 - SP) cost less than 10% of the OEM assembly. Our parts are also stronger than the OEM parts. A broken OEM part, with our new replacement part below it. For a price quotation or more information regarding any of our nozzles or services, please call or email us using the information in our "Contact us" page.